Sports Heaven's most exclusive restaurant is the Cafe 101. As the name suggests there are only 101 tables, each reserved for the greatest to don that number. As a sports fan, I love the idea of a paradise where all athletes are in their prime. A place where we can watch Sandy Koufax and Roy Halladay pitch to Babe Ruth and Lou Gehrig. A place where Terry Bradshaw can throw the deep ball to Randy Moss and Jerry Rice. Where Magic Johnson, Oscar Robertson, and Shaq can all play on the same court. Where Pele and Lionel Messi can go head to head on the pitch. So far, Sports Heaven’s most exclusive restaurant has seated 8 (Tables 7, 10, 27, 30, 53, 59, 80, & 88) and today we seat an additional 4. So without further ado we dive into today’s 4. Please click the corresponding links above to read previous Cafe 101 posts. With there being so few athletes who have worn the number 0 (let alone GREAT athletes), this was one of the easiest tables to snare at the Cafe 101. Of course most people think of Agent Zero, Gilbert Arenas, himself when they see this number and while Arenas has had a solid career I had to take MLB journeyman Al Oliver. Al Oliver had a great career. He was the runner-up for the Rookie of the Year award, was a big part of the 1971 world champion Pittsburgh Pirates, and his 1982 batting title shows that he performed over a long period of time. In 1980, as a member of the Texas Rangers, he set an MLB record with 21 total bases in a doubleheader. Al Oliver ranks in the top 50 in several MLB categories including hits (2,743), games played (2,368), total bases (4,083), RBIs (1,326), & Extra base hits (825). Additionally he had a career batting average of .303 and hit 219 home runs in his 18 year career. There are many who believe he is deserving of induction into the MLB Hall of Fame. I don’t know about all that but I do believe he is clearly the most deserving of Table #0. There are many, many, many great athletes who have worn the #32 and I knew this number would be tough and spark a lot of debate; but this table has to go to Magic Johnson – in my opinion, the greatest point guard of all time. You could even make an argument that he’s the greatest player of all time. From his college career at Michigan State to his HIV-shortened NBA career with the Lakers, Magic Johnson was always the consummate professional and a winner at every point of his career. His 11.2 assists per game average is still an NBA record and his rivalry with Larry Bird that started in college is the stuff of legend. Some of the greatest athletes of all time have worn 32 and in my eyes, Magic was the greatest of the great. 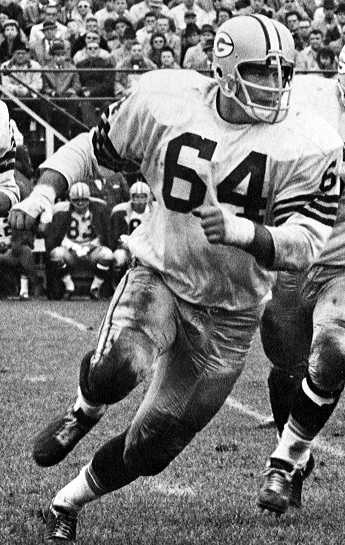 It is absolutely shocking to me that Jerry Kramer is not in the Hall of Fame. In fact, he is the only member of the NFL’s 50th anniversary team not in the Hall of Fame. When we’re talking about the #64, for me, it came down to two of the greatest guards in the history of the NFL. It came down to Jerry Kramer and Randall McDaniel. For me this was tough because it was about a Viking vs. a Packer and while Randall McDaniel is a Hall of Famer and widely regarded as the most versatile offensive lineman of all time, but I have to admit that Kramer is the better guard. Jerry Kramer was an integral part of the famed “Packer Sweep” that helped lead the Pack to 5 NFL Championships. His ability to get around the corner helped win the Packers the first two Super Bowls and is a big part of the reason that Jim Taylor is in the Hall of Fame. His most notable achievement as a blocker is probably leading the way for Bart Starr to score the winning touchdown in the “Ice Bowl”. Additionally he spent three years as a kicker for the Packers amassing 117 points. In the 1962 NFL Title Game against the New York Giants, his three field goals and PAT were the difference in a 16-7 Packers victory. Kramer has been snubbed by the Hall of Fame but he wasn’t about to get snubbed by me. Table #64 belongs to him. The #91 debate really came down to some great defensive players in their respective sports. On one hand we had Pistons & Bulls great Dennis Rodman who is one of the greatest defensive players the NBA has ever seen. On the other we had Sergei Fedorov one of the best defenders and playoff performers to ever grace the ice. In the end, I had to give the nod to Feds. Fedorov is a proven winner who proved to be among the best in the world at every stage of his career. His 1993-94 season is one of the best seasons anyone has ever put together. He won the Hart, Selke, and Pearson Trophy all in one season. That would be the equivalent of winning the MVP Award, Defensive Player of the Year Award, and being voted All-Pro unanimously all in one season in the NFL. It’s absolutely unbelievable. In 1998 he won the Stanley Cup and the Olympic Silver Medal in the same year. As great as Feds was during the NHL regular season, he was phenomenal during the playoffs. He is considered by many the greatest playoff performer of all time. He holds the record for most points in overtime (27). He is ranked 13th in playoff points, 12th in playoff shorthanded goals, and 8th in playoff assists, and he was the 3rd player to have 4 consecutive 20+ point Stanley Cup Playoffs. Yep, the Russian Rocket is more than worthy of Table #91. Agree? Disagree? Tweet @can_of_corn with hashtag #Cafe101 to tell us your picks! 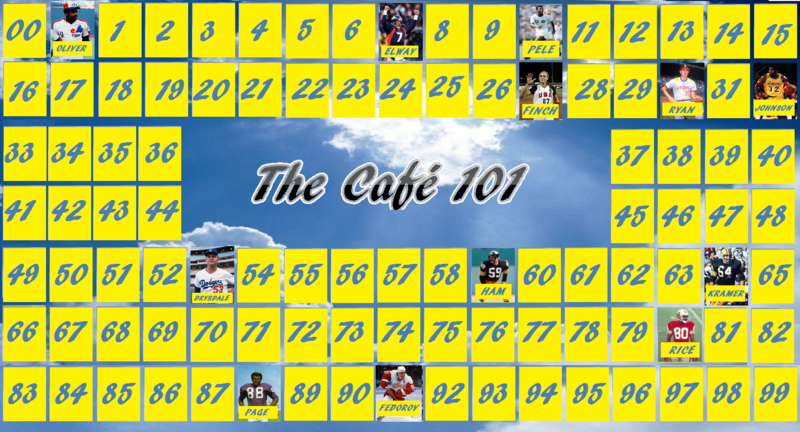 Will your favorite athletes be able to get a table at the Cafe 101? Keep reading to find out! If you have any questions, comments, or snide remarks please comment below or tweet them to @can_of_corn!